I must be getting a little punchy. I drove six or seven hours today and ended up back in Fresno. I’m sure Fresno is a nice city, but I didn’t drive out west to spend two nights in Fresno. Yesterday, my plan was to get a hotel on Hwy 41. Then, in the morning, I could drive out of the hotel parking lot, take a left, and set out directly for my campsite. I might even be able to set up camp in time to make a short trip into Yosemite. I couldn’t find a hotel right on Hwy 41, so I spend the night a few exits away. By the time I woke up and started out, I forgot I wasn’t on 41. Happy and clueless, I headed north into farmland. I eventually had that vague sense that something was off. When I stopped to ask for directions at a Gas-n-Sip, the clerk gave me one set of directions and a helpful customer gave me another. Confused, I went back to my car and figured out a third route. My route made sense on the map. I found a road that would bring me close to Mammoth Campground, where I had a three day reservation. I figured, once I got close, I could ask for directions for the last few miles. As I was driving straight up the side of a mountain, I came across a cyclists sitting on the guard rail, catching his breath. Then, I saw a small boat abandoned on the side of the road. I guess the owner couldn’t pull it up the steep incline. Then, I saw a mini-van, hood up, steam rising from the engine. I was probably three or four miles from my campsite, but I couldn’t get there. 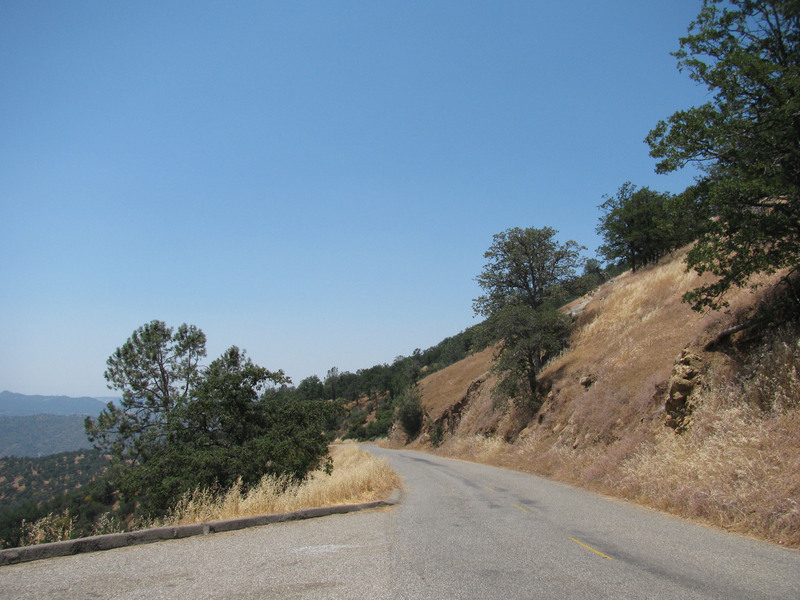 So, I went down the mountain, found Hwy 41, and started back up the mountain. Hwy 41 was straight. Hwy 200 was full of curves. South Fork had even more. I was moving along at about 30 mph for over an hour. I passed a large RV on the side of the road, steam rising from the hood. I stopped to see if the driver needed help. The main help he needed was to know the name of the road he was on so he could call a tow truck. I honestly don’t know how a tow truck could pull an RV off that mountain road. I drove about 10 miles past where the campsite should be and never found it. About this time, I realized my campsite, even if I could find it, would not be a good base for visiting Yosemite. On the way up the mountain, I saw a sign that said something like: “HWY 573 to Yosemite Closed.” My campsite, which I thought was about 30 minutes from Yosemite, was probably a three or four hour drive from the park. By the time I hit the gate, I would need to turn around. So, I headed back to Fresno. By this time, about 3:30, I was exhausted. I pulled into an Applebee’s for lunch. I needed a few minutes to decide what to do next. On trips like this, I usually like making decisions on the fly. I was stumped. Over lunch, I decided to check into a hotel and regroup. This is the part of the trip that I had planned with the most detail. I thought Yosemite would be the highlight of the trip. I had planned on maps. I had planned on websites. I even tried to talk to a human being, but was soon lost in an automated phone system. I pushed two when I should have pushed three. Now, I wanted to head in the other direction. Steinbeck wrote, “You don’t take a trip; a trip takes you.” Today, I got taken. Every trip, short or long, has a day physical or emotional exhaustion—if you’re lucky, maybe even a complete emotional meltdown. It’s not necessarily a bad thing. It’s a release, and what is being release might have been building up long before the trip began. This has been the first bad day of an otherwise great trip. I can’t complain. Congratulations! You got one green dot, one red, and two blue, all on the same day! Today was actually the second day that I have at least passed through two national parks in the same day (Yosemite and Sequoia). That ought to earn me some dots. When Jeff and I passed through Fresno I was taken by how completely the highway system kept passers-through at a distance from the city proper. I would hesitate to say that I have ever truly been in Fresno. I remember feeling taken with the drive East from Fresno, but am not sure I should attribute my impression more to the actual formation of the land or to the fact that the sun was setting as I passed through. Hopefully you can help me resolve my uncertain memory of that route. At one point, I got off of Hwy 41 in Fresno and could not get back on. I don’t mean I couldn’t get back on for three or four blocks. I couldn’t get back on. I had to get on another highway, leave town, and circle back around. George ,sometimes getting lost will let you see things you never planned on seeing. Maybe you should ask a frind to go with you next time and be in charge of directions. There are times that it would definitely help to have a navigator. I often pull over to look at the map. Of course, in some parts of the country, maps only help the people who live there. For people who don’t know the terrain they can cause more problems than they solve. I empathize with your “lost on the highway” day. I had the same problem driving there in June and got lost 5 different times because what the map said was not always what the roads said. Have you noticed that signs are often conveniently hidden? They were sure easy to miss. Primal scream therapy used to be a big thing. Well, driving in California can sometimes be a great motivator. Just consider today therapy. Therapy. Maybe shock therapy. It was a frustrating, exhausting day, but I think you are right. Some of the bad days are a form of therapy.